More than a decade since cats first conquered the internet, feline stars are now drawing audiences to the big screen. Why are we so obsessed? One man has the answer. I sit with almost 800 other people in a packed, historic movie theatre in Milwaukee, Wisconsin. The room is lined with ornate Buddha statues, smells like buttery popcorn and buzzes with excitement. The people here aren't about to watch the latest Hollywood blockbuster, but a feature-length compilation of cat videos from the internet. The audience gasps, coos and laughs along at the mix of funny clips and more thoughtful videos that feature. A blind cat beats the odds to find a loving family, another cat single-handedly scares off a brown bear... admittedly, I cry a couple of times. The production is the creation of Will Braden, a 39-year-old filmmaker from Seattle, Washington. Over the last few years, he has become king of the cat video world. He estimates that he watched about 15-17,000 last year alone. It's fair to say that this is not a direction Will ever thought his career would take. His journey with cat videos started back in 2006 when he was a student at the Seattle Film Institute. "I was supposed to do a video profile of someone and I had just procrastinated way too long," he recalls. Eventually his attention turned in desperation to the family pet he was looking after. "I thought, maybe I'll do a video profile of this cat and if I parody some of these old French New Wave films we've been watching and I make it funny enough, maybe they won't notice I didn't really follow the assignment," Will says. Henry, a black and white longhair tuxedo cat, became Henri le Chat Noir - a character with a parodied pretentious French persona. The video features stoic shots of the cat and is narrated with existential musings and cutting criticism of the human world around him. Is it safe for cats to be vegan? The clip was uploaded to YouTube in 2007, back when the website was still in its infancy. It was the same time that cat popularity on the internet was just taking off. But it would take five years for Will to produce a sequel - Henri 2, Paw de Deux. The decision came after he made a Facebook account for Henri and fans begged him to make more. "I made a new video and that went viral really quickly - I think it got a million views within four or five days," Will says. That episode has now been watched more than 10m times. 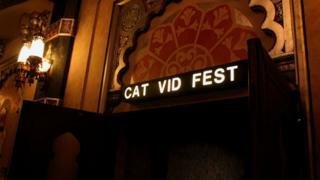 That year, in 2012, the first ever Internet Cat Video Festival was held by the Walker Art Centre in Minneapolis. Henri was included after receiving thousands of nominations from the public. Will went along to watch, and to his surprise, ended up taking home the prestigious Golden Kitty award (...think Oscars Best Picture). The win brought a mass of media interest which solidified Henri as a star. Celebrities, including actor Christopher Walken, counted themselves as fans. Henri ended up getting a book deal and a sponsorship deal with a cat food brand. Now well into his mid-teens, he officially bid Au Revoir and retired from YouTube last year. Cat videos remain a huge part of Will's life. He began helping to organise the festival in 2014, and then took it alone as CatVideoFest in 2016 when the art centre stopped hosting. Since, he's been a one-man-band running it alone. His day job involved combing through the far corners of the internet, thousands of submissions, booking venues and handling marketing. In 2018 he signed a nationwide distribution deal - a move that has made the festival's ticket sales explode. By the end of 2019 the film will have reached more than 200 theatres across the US. A chunk of proceeds from each screening is donated to a local cat shelter in every city. Tens of thousands of dollars has already been raised in the first few months alone. Andrew Carlin, from distributor Oscilloscope, says that the film grossed more than $37,000 (£28,000) across just five showings in Detroit, Michigan - even outselling the new Captain Marvel film being shown in a giant cinema complex nearby. "It's one thing if you're selling out shows in Chicago, or Brooklyn, you know, all these sort of hipster places," Will says. "But to be able to say: yeah we just added three more shows in Lubbock, Texas and Appleton, Wisconsin." Do doggos run the internet now? The filmmaker laughs when he discusses how his wife's family struggle to explain his unusual job to new people. More than a decade on since cat videos exploded online, the trend shows no sign of abating. But what is it about them that makes us so obsessed? "We love cats, but we like to see them taken down a peg too," Will believes. He has tried to make similar videos of dogs, but insists that it's not quite the same. "Because cats are so graceful and aloof we like to see them slip and fall, whereas if you see a dog slip off a stool you go: Oh no, is he OK?" He also thinks the festival's success is a "by-product" of how we binge-watch media now. "If you watch four cat videos in a row - guess what the next suggestion is going to be," he says. "The film festival sort of works on that principle of, you're going to sit here and it's going to be curated for you." The mood at Milwaukee's Oriental Theatre for the film showing was electric. The event was attended by people of all ages - some even dressed up in in cat ears and themed outfits for the occasion. Richard, one ticket-holder, came clothed in a full leopard-print onesie. He said that he was "so excited" to watch the film, and as an owner of three rescue cats, thinks supporting local shelters is important. At some screenings local shelters have even brought along animals who need new homes. At one showing, three felines left with a new family. Will believes cats provide the ultimate "distraction" from the outside world and hopes to eventually take the project international. "I cannot tell you how many times in the last two years people have come up to me and just grabbed my shoulders and said: I needed that - I needed 75 minutes of just cats," he says.